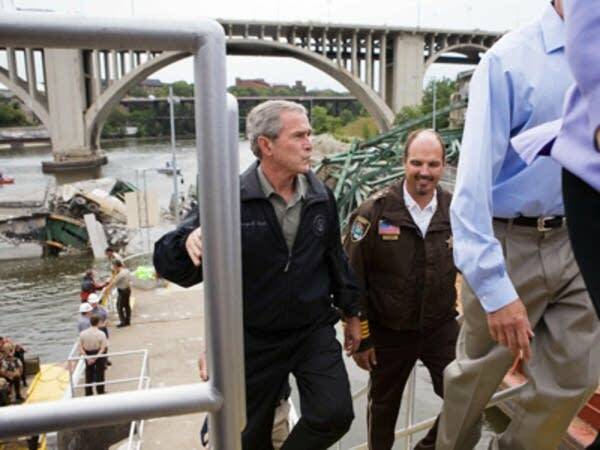 President Bush first took an aerial tour of the collapse site. After about 10 minutes in the air the president's helicopter landed, and Bush got a much closer view of the wreckage. 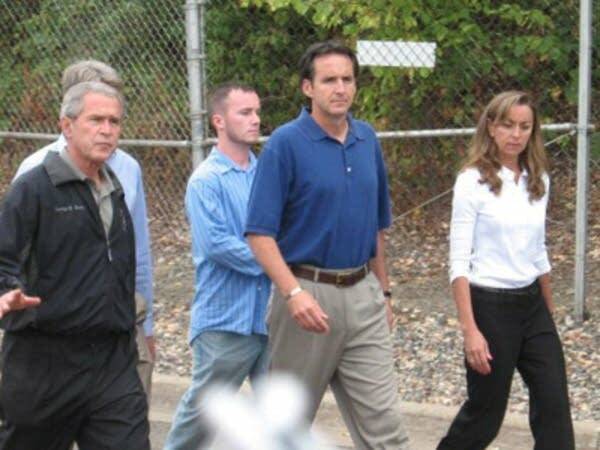 Flanked by a delegation of local elected officials, Bush walked down close to the river, about 100 feet away from the hunks of twisted steel and concrete. Even in the presence of the president, rescue divers didn't stop their work. They continued to feel through the murky waters in search of human remains. After the tour, the president offered words of support for the victims. "On behalf of the citizens of America, I bring prayers from the American people to those who have suffered loss of life as a result of the collapse of the 35W bridge here in the Twin Cities. I bring the prayers of those who wonder about whether they'll see a loved one again," he said. President Bush praised the efforts of the people who carried out rescues. He also singled out the efforts of Gary Babineau, a 24-year-old man from Blaine who helped rescue school children from a bus that was perched precariously on the broken bridge deck. "His instinct was to run to a school bus of screaming children and help bring them to safety," Bush said. "We have an amazing country where people's instinct, first instinct is to help save life. And a lot of people's first instincts in the Twin Cities was to save the lives of someone who was hurt." The president pledged federal support for the rebuilding of the bridge, though he didn't know how long that would take. But he did announce that Secretary of Transportation Mary Peters will lead the effort. He says federal, state and local government will have to work closely together to rebuild the bridge. "There's a lot of paperwork involved with government. And one of our jobs is to work with the governor and the mayor and the senators and the members of the congress to cut through that paperwork. And to see if we can't get this bridge rebuilt." Minneapolis Mayor R.T. Rybak accompanied the president during his visit to Minneapolis. Rybak also sat in on a closed-door meeting with the president. He says the meeting was productive and he says the president offered details about how the federal government will help the city. But Rybak didn't reveal what those details were. "I thought we had a very frank meeting in which we made it clear to all the players at the table that we had to do the extraordinary work together," Rybak said. Gov. Tim Pawlenty, who also walked alongside the president on Saturday, added that they will wait to hear back from the federal government on some specific aid requests. "Both the mayor and I presented the president with letters of request for assistance in various categories including some backup materials and what that means in a little more detail. He and his staff will be reviewing that. Obviously the federal government has already provided assistance and we want to make that as generous as possible," Pawlenty said. Congress is in the process of approving a quarter of a billion dollars in federal funds that will help pay for bridge reconstruction. However some estimates put bridge replacement at $300 to $400 million.